Every month, we invite new and existing Mercer Union members to our One Hour Mixers. On Friday 23 May, we’ll be jamming to a recording of Bunchoffuckinstoops, live at the Bloor Ossington Folk Festival 2013. Enjoy a drink on the house, good company, and Sarah Pierce’s exhibition Lost Illusions/Illusions perdues (part two), before it closes Saturday. Not a member? To have access to this and future monthly cocktail mixers, become an Associate Member starting at only $25 dollars at the door, or in advance on our website under Join & Support . 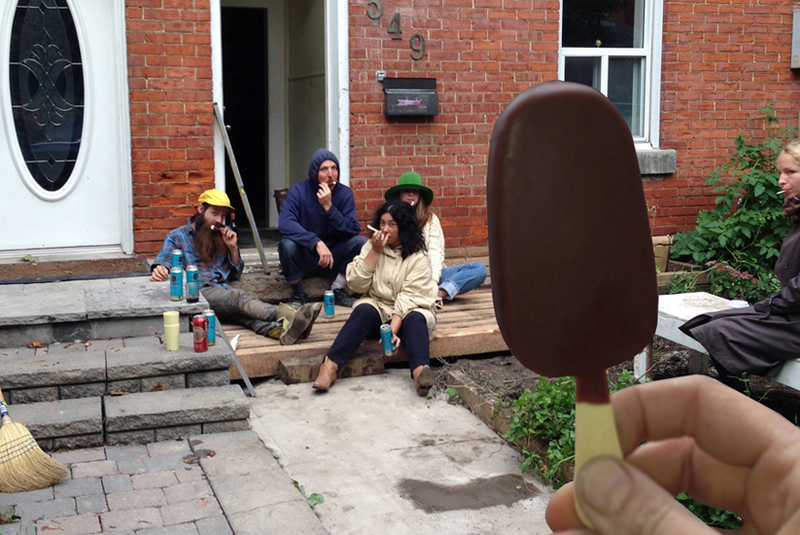 In September 2013, a crew of Toronto based artists convened to build a front stoop on Roxton Avenue, near Bloor and Ossington. This weekend long project of physical labour culminated in a three hour impromptu musical jam, a maiden social voyage of the stoop sessions. The Bunchoffuckinstoops were born both in this moment of celebration and as a reaction to the Bloor Ossington Folk Festival which had been simultaneously occurring over the course of the weekend. While this recording is essentially an unedited hour-long noodle, distinct tracks emerged, including ‘sweater whether’, ‘my heart will go off’, and ‘impromptu in tyre flat’. This recording was impulsively made and forgotten until May 2014. Participants in this recording include: Janis Demkiw, Emily Hogg, Charlie Murray, Seth Scriver, and Jessica Vallentin.